They live in our homes and are an intimate part of our daily lives. We take care of their physical needs, play with them, and love them, and in return, they richly reward us with unconditional affection and loyalty. Yes, pets can be our best friends, but they are also really good for our health! As a pet owner, I know how wonderful having a pet can be. I also know how rewarding it is to share that feeling with those who may not own a pet. My family and I participate in a very special program, Pets On Wheels (POW), with our “therapy dog,” Miley. Therapy dogs visit nursing homes, assisted living facilities and hospitals, where they are welcomed with open arms. Patients who may be withdrawn or even unresponsive will react in a positive manner to visiting pets. Even those normally afraid of dogs will eventually smile, laugh and actually pet the animals when they realize how gentle and loving they are. 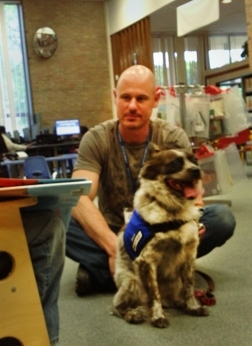 POW therapy dogs also visit college campuses and libraries, easing the stress students face during exam times. Pets love unconditionally and do not judge us. They are real people magnets, especially for children. They are also great listeners. Several times a month our dog Miley visits local libraries as part of the “Paws to Read” program. While Miley relaxes on the floor, children who may not be comfortable with their own reading skills will read aloud to the dogs without fear of being judged or laughed at. It’s not surprising, then, that research has shown that having a pet can have therapeutic benefits. To better understand this concept, I spoke with Ruth Shor-Jannati, LCSW-C, therapist at Jewish Community Services, who shared findings. According to a study recently reported in “The Journal of Personality and Social Psychology,” pet owners had greater self-esteem, were more physically fit, and tended to be less lonely and less depressed than people who did not have pets. They were also more extroverted, less fearful and more conscientious. Other studies of pet owners in their 30’s and 40’s found that they were happier and healthier, and had higher feelings of belonging. Ruth Shor-Jannati also noted research showing that animals help children cope better during difficult or challenging times. For example, they can be beneficial in helping children dealing with a loss of a friend or a family member through a move, death or divorce. The simple physical act of just petting an animal is a soothing experience, both for children and adults. Taking care of a family pet is a great way for a child to learn responsibility and compassion. Pets really can be a wonderful impetus for building a sense of bonding and social consciousness among family members, for example, when they work together to train their pet as a therapy dog and then volunteer together through programs like Pets on Wheels. So, all of you pet owners, remember that you have a great booster of good health, right at your fingertips and at your feet in your own home.